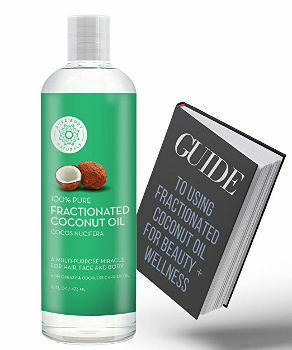 Coconut oil has become a popular ingredient in many beauty products due it its fatty acid richness as well as antibacterial and antimicrobial properties. It has been used for many centuries for hair care and due to its molecular structure, the nutrients it contains penetrate beyond the cuticle of the hair, repairing it inside out. Coconut oil is said to promote hair growth and reduce hair loss, but is this another hyped claim or there is some evidence about it? Before looking at the best coconut oil for hair growth and hair loss on the market today, let’s dig deeper into the benefits of coconut oil for hair. Can Coconut Oil Make Your Hair Grow? Is Coconut Oil Good For Lice? Coconut oil can help your hair grow because it nourishes the scalp, removes sebum from the scalp and is loaded with vitamins you hair may need. In addition, it protects your hair from sun, wind and pollution, which can dry your hair leaving it brittle and easy to break. When coconut oil is massaged into your scalp, it can improve circulation and strengthen your roots. The Linoleic acid in coconut oil can also improve hair elasticity and prevent breaking. Coconut Oil has many nutrients that prevent hair loss and promote healthy hair growth. It also maintains hair healthy and adequately nourished. You can prepare an easy home remedy by boiling some sage leaves, mixing the infusion with Coconut Oil and applying this wonderful naturally scented mixture to the scalp. Naturally, Coconut Oil works great for dry hair and dry scalp and especially for hair with dandruff to prevent or remove it. It is also good for dermatitis or fungal disease. It has a great ability of moisture retention, so it helps to keep the hair and scalp soft and hydrated. One of its best components is fatty acids which act as an effective anti-dandruff treatment. The easiest coconut oil treatment you can follow if you have dandruff is massage a little bit of the oil onto your scalp and leave it there for about 30 minutes. Then, shampoo properly until your hair is clear. Keep in mind that it is very important to apply the oil regularly. You can also mix lemon oil with coconut oil and massage it into your scalp with your fingertips. Cover your hair and let the oil set on your scalp overnight and wash out in the morning. Lice is a very common and disturbing problem especially in the hair of children. Chemicals are very quick to act but they can also cause irritation to the scalp. A good solution is to cover your hair completely with coconut oil and then slowly comb it, this way it is easier to get rid of the lice. Coconut Oil has cooling properties, so by applying it to your scalp and hair, you will enjoy a refreshing effect. In very hot or cold weather conditions, sudden temperature changes, or in cases of sweating, it can calm and relax an irritated scalp. Coconut oil also helps in toning the hair and especially dry hair. 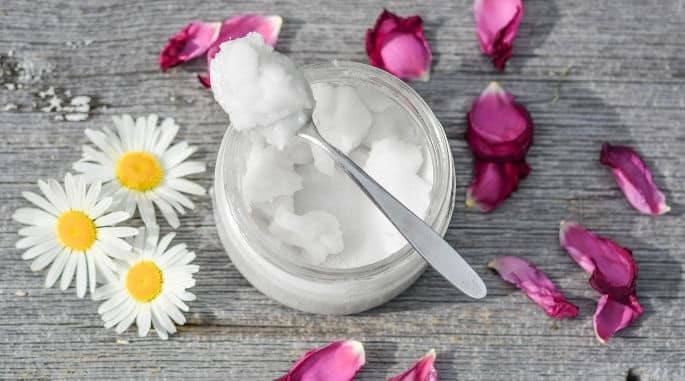 With so much being written and said about chemical ingredients in beauty care products, more and more people are looking for natural ways to care for their skin and hair. Coconut Oil has been very popular in hair care and people also use it to create their own DIY hair care products. So, let’s have a look at the best coconut oil for hair treatment. Sometimes, finding a good product is simply a matter of choosing the coconut oil brand that your trust or that fits your individual budget. 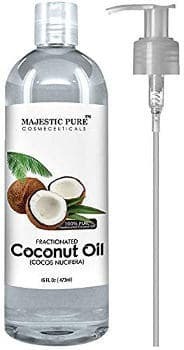 Majestic Pure Fractionated Coconut oil comes in a 16 ounce clear bottle with a pump dispenser. This 100% pure coconut hair oil works as hair moisturizer and can be used as both a hair conditioner and a hair mask. People who use it find that it helps to thicken thin hair, prevent breakage and heal split ends. Frequent use of this natural product results in softer more shining hair that is easy to untangle and manage. 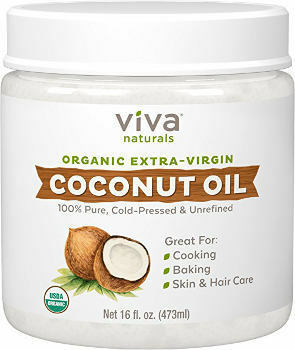 Viva Naturals Extra Virgin Coconut oil comes in a 16 ounce white jar and is 100% pure and cold pressed. It easily melts in your hand and moisturizes even the driest hair. Users review that it leaves their hair soft, tangle free and easy to manage. It can be used both by itself as a leave in or rinse out conditioner as well as combined with other hair healthy oils to create a natural hair mask for strengthening hair and preventing hair loss. This product helps to heal dry scalp and stop the itching that dry scalp causes as well as reduce hair breakage when you brush or comb your hair. Pure Body Naturals Premium Fractionated Coconut oil comes in a 16 ounce pump bottle and helps to tame frizzy hair without leaving it oily. Users like the moisturizing effect of this oil as well as the fact that their hair feels softer and more supple when using it. It helps moisturize dry scalp and tame flyaways. Using coconut oil makes people’s hair easier to detangle and manage. With less breakage, their hair grows faster and is healthier looking. 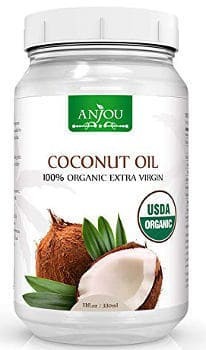 Anjou Coconut Oil comes in an 11 ounce jar and is organic, unrefined, cold pressed and extra virgin. Users say that it is perfect for a hair mask or as a leave in hair conditioner. It softens the hair and leaves it shiny. Some people also experience faster hair growth and less breakage and split ends. Other benefits include the fact that it leaves hair more manageable with less frizz and easier to style. After only using it for a few times, users find their hair looks and feels more healthy. 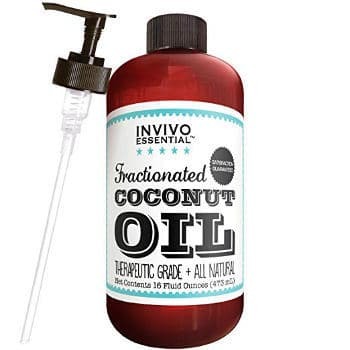 The Invivo Essentials Fractionated Coconut oil comes in a 16 ounce amber pump bottle and is therapeutic grade (not for internal use). It is 100% pure and contains no additives. Used as a hair conditioner, it works great for dry or color treated hair. People like that it leaves their hair tangle free and men with beards also report that it reduces beard dryness and itching. In addition, it seals in the hair’s natural moisture and makes detangling your hair easier. It is great when used as a hair mask by itself or combined with other hair healthy oils. 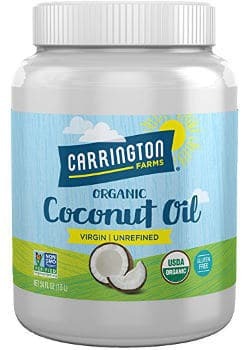 Carrington Farms Organic Extra Virgin Coconut Oil comes in a 54 ounce BPA white container. It is certified organic and contains no additives. Used as a hair conditioner and moisturizer, this oil treats dry scalp and relieves the itching that dry scalps causes. When used regularly, it can help prevent hair loss, hair breakage and split ends. Users like that it reduces tangles and leaves hair shining and healthy. It can also be used as a hair mask. 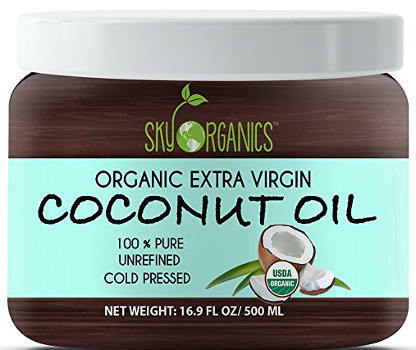 Sky Organics Coconut Oil comes in a 16.9 BPA free ounce brown jar. It is 100% pure, cold pressed and contains no additives. This product revives hair and can stimulate hair growth. It also adds luster and shine, leaving hair softer and smoother. It helps to reduce dry itching scalp and most users find that it quickly makes a difference in their hair’s health. People state that it tames frizz and makes a perfect replacement for chemical laden hair conditioners while it also works well as a hair mask. 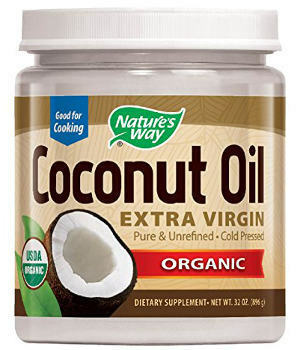 Nature’s Way Extra Virgin Organic Coconut oil comes in a 32 white jar and works great as a hair conditioner or hair mask. It eliminates frizzy hair and leaves it smooth and shiny. Users review that using this oil helps to return their dry hair to health while reducing breakage and healing split ends. They also like that after using it, their hair is more tangle free and manageable. This large jar lasts for quite a long time making it an excellent value. 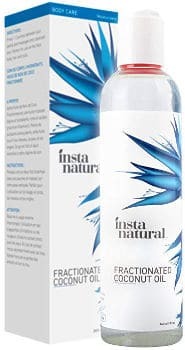 This InstaNatural Fractionated Coconut Oil is 100% pure and comes in a white bottle. Users find that it relieves dry scalp and leaves their hair feeling soft and silky without leaving it sticky or oily. It also makes for a great conditioner or hair mask reducing breakage and healing split ends. Overall, it leaves their hair healthier, fuller and shining. Some people use this oil for daily hair care and others use it 2 or 3 times a month as a hair strengthening mask. 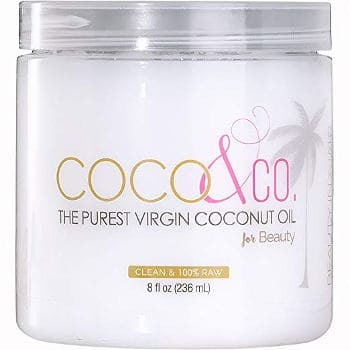 This coconut oil penetrates the hair strands helping to strengthen hair and prevent breakages and split ends. Users say that using this oil results in thicker hair and as a hair mask, it leaves their hair smooth, shiny and healthier looking. In addition, it heals color damaged hair and can help to thicken and grow eyebrows. It comes in an 8 ounce white jar and is 100% raw and organic. 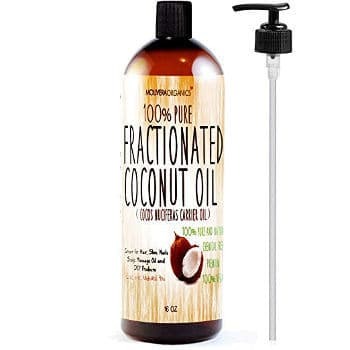 Molivera Organics Fractionated Coconut Oil is great for dry hair absorbing quickly into the hair strands. Users experience stronger hair that feels healthier and fuller when they use it regularly. It also reduces frizz and restores lifeless hair leaving it moisturized, shining and manageable. It is 100% pure and comes in a 16 ounce amber bottle with a pump dispenser. This Hydrating oil mist contains coconut oil together with other ingredients. It comes in a 4 ounce container and is not pure coconut oil. It softens hair and relieves itching scalp while reducing frizz. Users state that this oil mist relieves dry hair and leaves hair more shining. It also works as a detangler and doesn’t weigh hair down or leave it feeling greasy. There are various ways that you can use coconut oil to improve your hair’s health. Here are some different ways to apply and use coconut oil for your hair. As a Conditioner: You can use coconut oil as a leave in conditioner by simply pouring a small amount of coconut oil in the palm of your hand, rubbing your palms together and then working it through your hair. When used as a conditioner, this natural oil can tame frizz and leave your hair shining and looking its best. As an Overnight Treatment: Many people do leave coconut oil in their hair overnight and wash it out in the morning when they shower. However, if you are going to leave coconut oil in your hair overnight, you will get better results with mixing coconut oil with other ingredients that promote hair growth and prevent hair loss such as essential oils or rosemary, lavender, thyme or cedar wood. Deep Conditioning: To deep condition your hair using coconut oil, try warming this oil and mixing it with Olive oil, Argan oil or Castor oil. Then, apply to the scalp working from your scalp to the tips of your hair. Leave in about an hour and then wash out. If you want to use it as a deep conditioner, then you can apply and massage few spoons of Coconut Oil to your hair and scalp at night and next morning rinse it from your hair. You can repeat this process every few days. Mixing Honey With Coconut Oil: People combine honey with coconut oil to strengthen their hair strands as well as moisturize and thicken hair. They also use it to reduce frizz and make hair softer and more shining. If you are going to use coconut oil to your hair, there is a bit of a nuisance you should know about. After each use, you will have to wash your hair with a shampoo very well because if you leave some oil on, it can block hair follicles, which can prevent hair growth. In addition, the first few times you will try a hair treatment with Coconut Oil, it is better that you choose a day that you are free from any commitment because at least in the beginning, you will have to experiment the amount of oil you need for your hair and how long you should let it rest. It all depends on the density of your hair, length and condition. After the treatment, if your hair is greasy, then try using less amount of coconut oil next time. While many users have had great success with coconut oil as a hair treatment, some have had the opposite effect. When used properly, coconut oil can be beneficial to the health of your hair. Just remember that coconut oil may not be for everyone. So let’s have a look at some precautions. Whether or not coconut oil is good for your hair depends on a number of different things including your hair type, whether or not you are allergic to coconut or coconut by-products, and how much coconut oil you use. Like any oil used in hair, coconut oil does not work for every hair type. People with fine to medium thick hair are likely to see good results from coconut oil including more voluminous locks. If you have very thin hair, you should avoid applying it to the scalp. In this case, just apply it along your hair from the middle to the end. If your hair is long, then you need to use more Coconut Oil, making sure that it spreads all over your hair. If your problem is only having dry and damaged hair ends, then just apply few drops onto your ends after showering. This can also work as a daily moisturizer. If you have dandruff or dry hair from overuse of products that strip your hair of natural oils, then coconut oil is often beneficial to your hair. However, if you tend to have oily hair or are allergic to coconut or coconut oil, then coconut oil may not be the right choice for your hair. In addition, the amount of coconut you use can determine whether or not coconut oil is bad for your hair. Using coconut oil in large amounts can leave your hair feeling and looking dirty and oily while it can also plug the pores around your hair follicles. Coconut oil works best when used in extremely small amounts or when mixed with other ingredients including olive oil, Argan oil, honey or Marula oil. Also, keep in mind that due to the high fat content of coconut oil, you need a shampoo that will remove all the excess oil from your hair and scalp. Coconut Oil has been an effective natural treatment for hair that is very popular among users. We also love this natural oil, so in this article, we have decided to offer you some good ways to benefit your hair by using Coconut Oil and recommend the best coconut oil for hair growth and hair loss options.